Cairo in a Hijab - Just an Average American hanging out in Egypt. By day seven, North Carolina seemed like a world away, like a dark children's fairy tale. Here in the Middle East we weren't worrying about volcanoes, political scandals, or any other petty western silliness. On Cairo time, things move slower- from one moment to the next and that's how we'd live our final day in Cairo. No plans, no time-tables, no one but ourselves to walk the roads of Egypt and discover it for ourselves. Luckily, a familiar sight, Lady Liberty in a hijab was there to help guide us. Whether it be London, Paris, or even Cairo the best way to experience a foreign place is to get lost in it. Forced to find your way back, while you discover the often less touristy, hidden versions of these cities. My grandfather used to say you never were really lost as long as you were on a road. I guess that's true, but it's also likely it was merely his excuse for not pulling over and asking for directions. Losing yourself is as easy as heading down to the Nile and crossing a bridge, and that's just what we did. We passed a statue reminiscent of the those that the American media shows toppled over indicating unrest in the Middle-East. 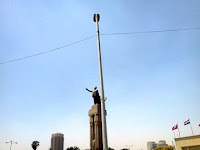 Whomever this statue was, he pointed towards Cairo untouched unlike similar idols of the former president. We then walked over to the Cairo Tower which loomed in his background rising to the heavens. There were some nice parks we'd had loved to enter, but required an admission fee. 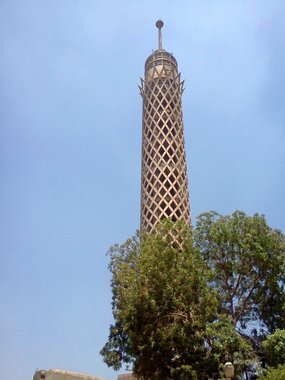 Everything costs in Cairo- something that seems self defeating for a tourist country on the mend, but then it also prevents beggars and the people who wish to damage such places. 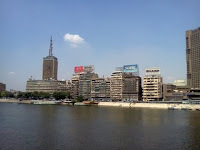 I hope to come back some day when the "new" Cairo has had time to crawl out from under the oppression of Moubarak and to see a more open and free city. However we felt it better to see the alleyways than the groomed gardens. Some abandoned, some filled with men who stare at your blonde hair, and western girth as if they wanted to make both love to you and slice you for bacon. I can say in truth that it became a bit too much at one point as the groping and touching became overwhelming in certain parts of Cairo. So on this day, I approached each turn with a certain level of caution that Shannon, whose darker complexion allowed her not to adhere to. In the end, except for a few stares... our journey was rather uneventful. 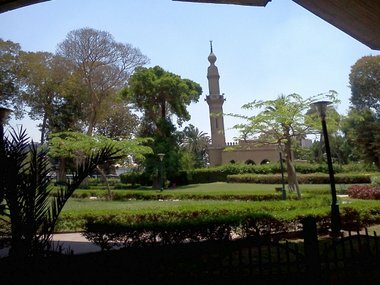 Pay to see "pretty" Cairo and its gardens. The heat sneaks up on you in Cairo, it floods the streets like a river, flowing between the abandoned buildings, and shines through the broken out windows and doors. A simple short bridge seems to go on forever as you begin to cross it and become parched of thirst. You begin to sweat so much that larger than normal salt crystals form on your face till you take on the appearance of white sand paper. The water bottles are now empty as you start to run out of breath. It's the first signs of heat exhaustion. 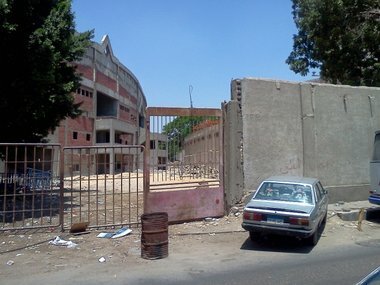 Half way back to Tahrir square with my head now ringing I suddenly begin to hear country music. Is this what it's like when you die? You get groped by Muslim men listening to country music? But Shannon insists she hears it too, wait, "what's that? ", I'm not feeling that ill yet, "Is that a mirage?". 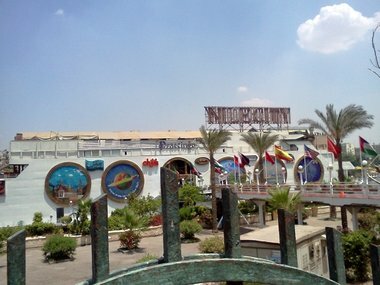 There in the middle of the Nile is a boat, a boat playing country music, and it is advertising "Lady's Hour - Everything 1/2 price!". I check the time on my phone, add six hour and realize "Lady's Hour" is going on at this very moment and has unlimited free refills. " I couldn't have cared if it was a culture clash or not... we were going to Chili's! 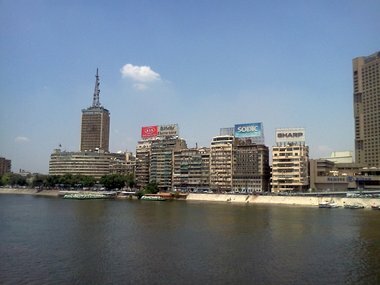 After about thirty or so free Coca Colas, and the manager arriving at our table worried about my tomato red, salt crusted face asking "is the A/C" okay", we were finally able to take in the beauty of the Nile. It actually was quite nice as we listened to Garth Brooks watching the fisherman outside the window. At one pointed I started singing the lyrics then realized the kitchen staff was staring on. You'd pay $150 a plate in the U.S. for a restaurant on the river, but here it was insanely cheap. Dinner on the Nile? Who cares if it's Chili's? It's still a unique, surprisingly different experience than its western counterpart. After our Oasis of refreshment tour on the Nile and bankrupting Chili's we headed back to Tahrir Square. Then back down to the hostel before venturing out again later that night. We knew our time in Cairo was coming to a close and we wanted to leave without remorse. 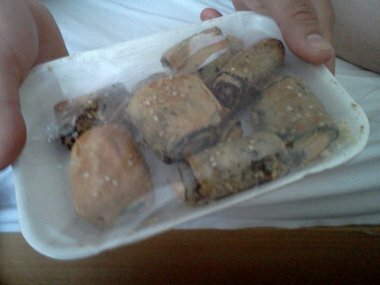 So we garnished every bit of gumption in ourselves and entered the local Arabic only corner market to buy some local treats and then shot over to a local back street Kashuri vendor. Yep that's right. No American menus, and no help from anyone else. 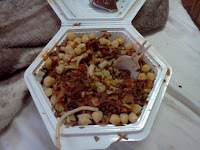 We did the real Egypt, the real food, with real people, and we knew we were leaving without regrets. We had redeemed ourselves, and gotten to experience a side of Egypt I imagine many tourists don't. Dirty floors, family filled tables, and when we made that last minute decision to walk in to that little Kashuri restaurant on the corner of the street- I think we might have impressed the workers there, that two naive looking white American girls would be willing to walk in and try some traditional food, something important to them. We changed the rules, it was now a journey with no man required. Perhaps in that single instance we birthed a meme that might spread throughout Egypt, one in which the fat, white, American women aren't always considered as ignorant, or lazy as the Middle-East has seen us in the past. 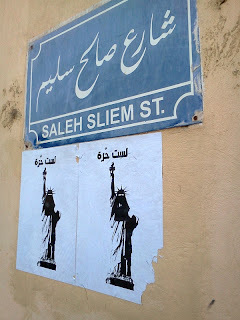 Who knows, we may have just changed Cairo.